Philosophical TransactionsÊis the worldÕs first and oldest scientific journal. 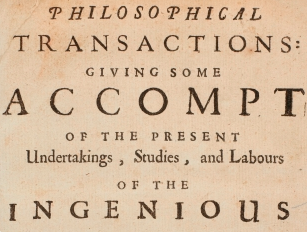 Still published by the Royal Society, it is about to mark its 350th anniversary, and was instrumental in establishing many forms and facets of modern scholarly publishing. Most notably, it is usually credited with having given rise to the system of academic peer review. Julie McDougall-Waters and Noah Moxham are postdoctoral researchers at St Andrews University.